Grit. This is a word that I inherently incorporate into my coaching and I believe in doing the simple things savagely well. There is a reason you are where you are at in your fitness journey. I get it. Life throws us all kinds of fun situations that we must adapt ourselves to and with that we must embrace growth. GRIT is digging deeper and finding your WHY. I am here to help you not simply go through the motions, but rather develop tenacity within yourself. I believe that fitness is an adventure and I am here to build an indomitable will that will carry you through whatever trial or setback that comes your way. 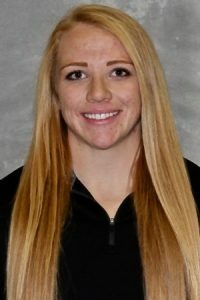 I am a Northern Colorado native that made my way up to Chadron State College in Chadron, Nebraska to compete for the track and field team as a thrower. I began teaching group fitness classes to Chadron’s community in the third and final year of my undergraduate escapade when I realized my passion for coaching. While obtaining my master’s I found myself as Chadron’s assistant strength and conditioning coach where I was the director of programming for female sports, as well as redshirt football. Mobility is a large part of my passion when working with athletes and I developed recovery programs across all sports that Chadron offers. My time spent as a coach at Chadron gave me insight into training a variety of sports and athletes with a large spectrum of weight room experience. Not only am I familiar with developing athletes of a high skill set, I am adamant about properly building aspiring athletes of all levels mentally and physically to elongate a healthy career. Competing as a high-level collegiate athlete, I know what it takes to make it at the next level and beyond from a coach and athlete perspective.